First of all, I wrote this page for Americans. In the United States, all species of venomous snakes are pit vipers - rattlesnakes, cottonmouth, copperhead. * Thus, you either got bitten by a pit viper or a harmless non-venomous snake. Was the snake big and fat with big needle fangs, and is the bite site black and blue and swollen while you experience the worst pain of your life, like a bee sting times a million? If not, you're fine! Wash the bite site with soap and water to keep away bacteria. If you did actually get a venomous pit viper bite, you're not reading this web page, you're on your way to the nearest hospital, bawling like a baby. So this web page is pretty much pointless. If it actually is a venomous pit viper bite, keep bite site as immobile as possible, but most of all, get to a hospital. Snake Bite Advice On How To Avoid And Treat Snake Bites - There are over one hundred different species of snakes in North America and Mexico, of these just under twenty of them is actually dangerous to humans. The venom that is injected into the victim has neurotoxins that will damage human tissue and when it enters into the bloodstream it can become deadly. Most people that get bitten from a snake are surprised and will panic thus causing more harm to their body from the bite. 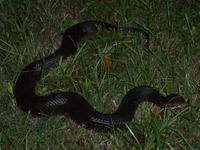 It is important to know the kind of snakes that live in your area and how they will behave when you come upon them. If you are bitten by a snake, whether you know it is poisonous or not, seek medical attention immediately. 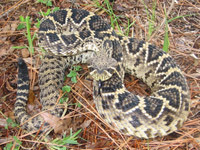 According to the American Association of Poison Centers there are about two thousand reported snake bites a year with about another estimated six thousand snake bites that are not reported. Out of these possible 8,000 incidents maybe five or six people will die, and it is usually because they did not get medical care within six to eight hours of getting poisoned. It is important to know what to do if you or someone close to you is bitten by a snake, as it could save your life or stop any further damage that can occur with snakebites. Ninety percent of all snake bites are on the fingers, hands and feet so when you see a snake it is best to leave it alone and walk widely around it or completely away from it. Avoiding Snakes All Together - The best way to not get bitten by a snake is to avoid coming into contact with it. 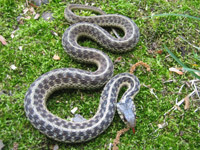 Most snake bites occur when someone is trying to get a closer look at the specimen or trying to actually kill the snake. It is true that this sometimes cannot be avoided especially if you accidentally step on the reptile or if you are out in the wilderness. There are some precautions that you can take when you are out in undeveloped areas such as wearing high rubber boots or hiking shoes and long clothing that protects your arms and legs. Most snakes can only strike out the length of their body so keeping your distance out of range of striking distance will avert any sudden attacks. • Using soap and water clean the wounded area. • Keep calm and immobilize the infected area and keep it below the level of the heart. If you are out in the wilderness when you or someone you are with gets a snake bite and you will not be able to get medical attention within thirty minutes of the incident, than there are additional steps that should be taken. Wrap a bandage two to four inches above the bitten area to slow down the venom, but not so tight that it cuts off the circulation. If you have snake kits available use the suction device to draw out the venom. Learn about the differences between a Venomous snake and a poisonous snake - and hwo it is that snakes produce venom. Things To Avoid Doing If Bitten By A Snake - The old adages of applying a tourniquet, cutting open the bite and sucking out the venom with your mouth is outdated and can cause more harm than help. Tourniquets that are not applied correctly can cut off the circulation to the infected area which may lead to amputation of the limb. 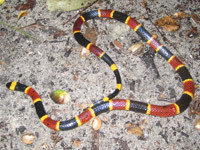 Cutting open the bite, as well as sucking the venom out can lead to harmful infections to both the victim and the rescuer. This can cause nerve and blood vessel damage. It is best to call and get medical assistance immediately. *Yes, there's the red black and yellow Coral Snake, which is the only non-pit viper venomous snake in the USA, but you didn't get bitten by that, did you? It's got a tiny mouth, it's very rare, it's docile, etc. If you did by miracle get bitten by a coral, get to a hospital now. You won't even notice pain from the venom until it messes with your nervous system and potentially causes breathing paralysis. Snake Guard Glue Trap which catches snakes. Chart of snake removal scenario showing snake tongs. How to get rid of Florida snakes in a snake sack. Do snakes feed their young babies?